Paris is easily one of our favourite European cities, and one that we return to time and again. It has so much to offer, from beautiful views to world class museums to fabulous food. We’ve visited a number of times, both for short breaks like the 2 days in this Paris itinerary, as well as for more prolonged stays. 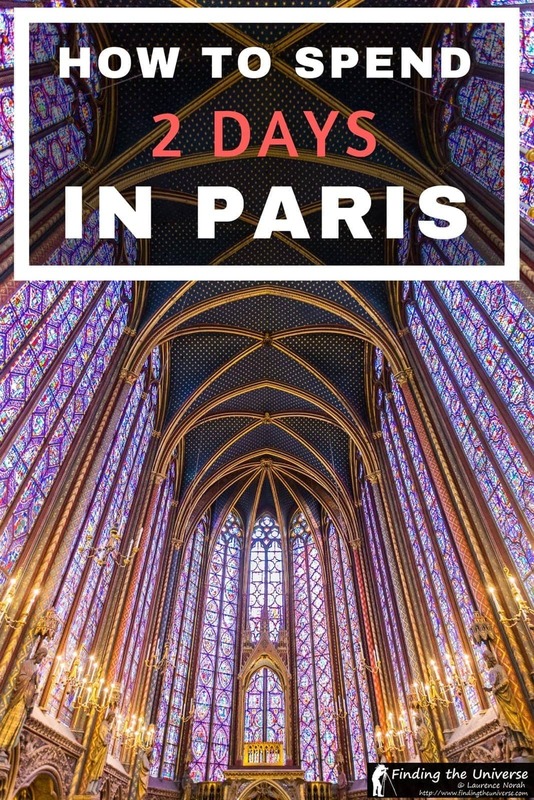 Speaking of a shorter visit, we wanted to share with you an itinerary for 2 days in Paris that will get you to all our favourite sights. It’s a fairly packed itinerary (feel free to adjust accordingly! ), but if you’re short on time in the city and want to see as much as you can – this will help you do that. If you have slightly longer, you might want to check out our guide to spending 3 days in Paris. 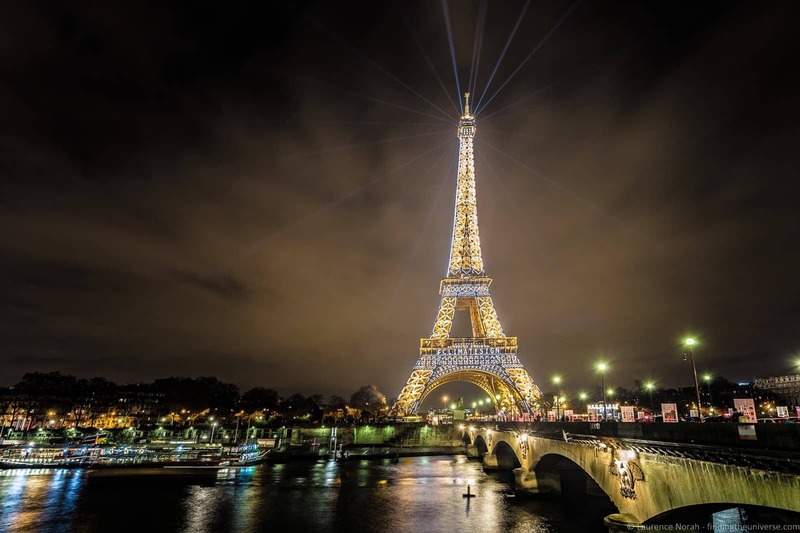 This Paris itinerary is perfect for a first time visitor, or even a returning visitor looking for a quick 2 day Paris itinerary that includes most of the major attractions. After the itinerary, we share some tips and advice for visiting Paris, as well as some ideas for saving money on your trip. Now onto our suggestions of how to spend the perfect 2 days in Paris. I have to admit, it took multiple visits to Paris before I actually visited Saint Chapelle. Suffice to say, my mind was blown. This is without doubt one of the prettiest churches I’ve ever visited, and I can’t believe it took me so long to actually go inside. With almost floor to ceiling stained glass windows, this 13th century gothic chapel will literally take your breath away when you walk inside. Don’t feel bad if you stand there, mouth agape with wonder. I certainly did, until I remembered myself and got to taking some pictures. It’s a truly wonderful place, and an absolute must in Paris. Saint Chapelle normally opens at 9am, and we highly recommend you get here by 9am sharp, if not a little earlier, in order to get in before the queues. It’s a relatively small attraction, and the security and ticket lines can be long, so arriving here when it opens will save you a lot of time. Entry is €10 at time of writing, and it’s included with the Paris Pass (see our review of the Paris pass here) and Paris Museum Pass. Just near Saint Chapelle is one of Paris’s most well know religious buildings – Notre-Dame Cathedral. 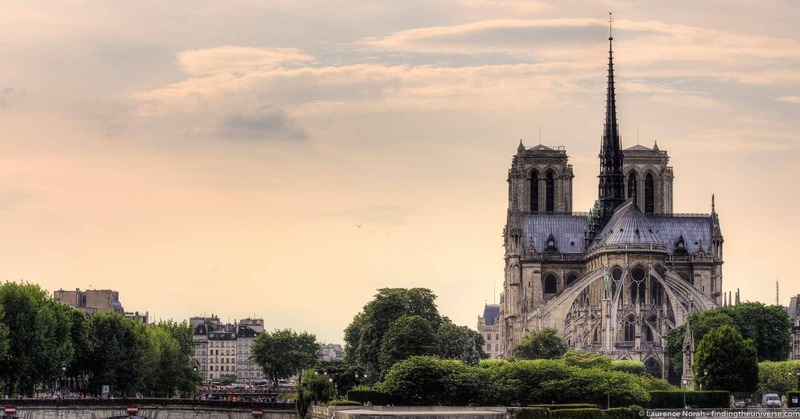 With two huge towers and mighty flying buttresses, it’s not hard to see why this has become one of Paris’s iconic attractions, not to mention one of the most famous churches in the world. Completed in 1345 after nearly 200 years of construction, Notre Dame is a beautiful building that is well worth the visit. You can walk around and appreciate the exterior, and of course, you can head inside. 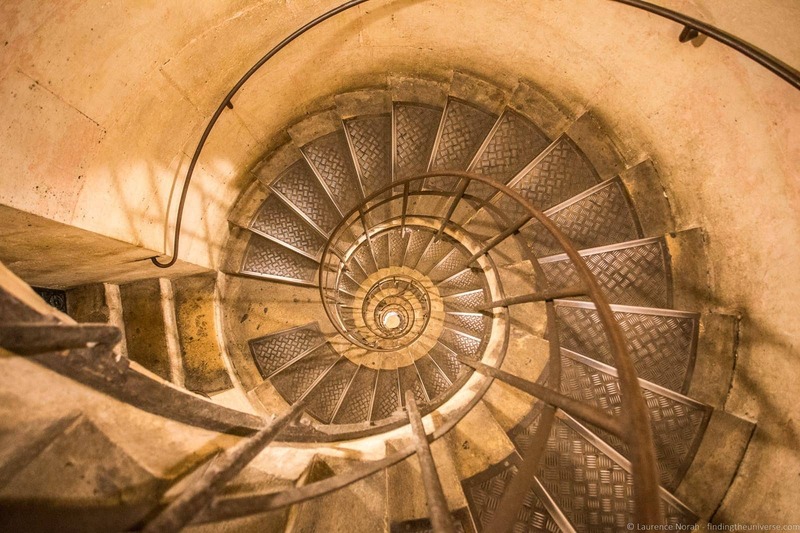 Entry is free, although if you want to visit either the towers or the crypt there is an additional fee (included with the Paris Pass and Paris Museum Pass), and you need to pre-book a timeslot for climbing the tower. You can either do this on site, or, ideally, using the “Jefile” app, available on iOS and Google Play. From Notre Dame it’s a 20 minute walk (or 15 minute metro ride) to one of Paris’s most famous museums – the Louvre. This is of course home to the Mona Lisa (which many visitors make a bee-line for!) and the Venus de Milo, but the largest and most visited art gallery in the world has a great deal more to offer than these two sights, from Islamic art to Greek antiquities. You could spend a whole day (or more!) just exploring the Louvre, but that would restrict the rest of your Paris sightseeing, so try and limit yourself to two or three hours if you can! Also, you should be aware that the Louvre is one of Paris’s most popular attractions, and lines can get long. There are two main entry lines, one fast track security line and one slower line for people without an advance ticket. We’d definitely encourage you to save money and time by either getting a fast track ticket in advance, or buying a pass that gives you access to the fast track line. 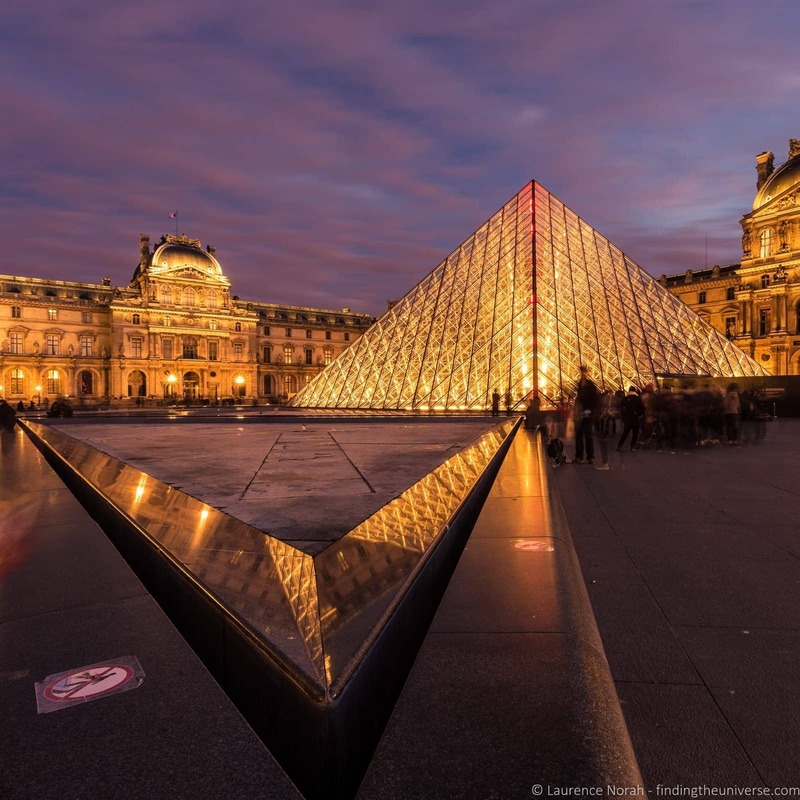 Both the Paris Pass and Paris Museum Pass offer free entry to the Louvre with fast-track access – see more at the end of the post on which pass is going to best for this two day itinerary. Depending on how much time you spend at the Louvre, you might have time for a spot of wine tasting afterwards. Note that this activity is one that we suggest you skip though if you feel this itinerary is a bit busy for you. France is known the world over for wine, so after you’ve sated your cultural curiosity at the Louvre, why not relax a bit over a glass of wine whilst learning all about the art of French wine making. Sound good? 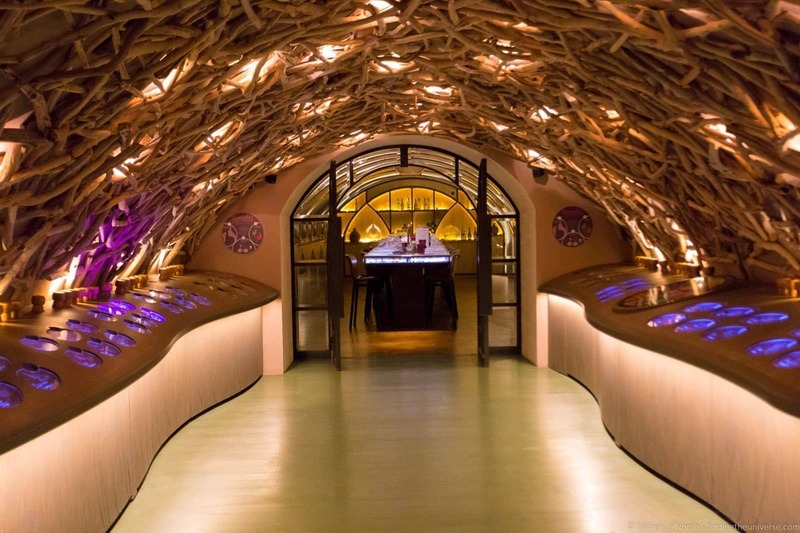 Well, conveniently, right next door to the Louvre you’ll find the “Caves du Louvre”, a relatively new wine tasting experience set in an 18th century wine cellar, formerly home to the wine collection of the King of France himself. Here, over the period of about an hour, you’ll try three different French wines, whilst learning all about grape varieties and the factors that go into the making of a French wine. It’s a fun experience, and you can either do it as a self-guided tour using an app, or with a tour leader. It’s currently €30 for the tour, but it is free for holders of the Paris Pass. If you choose the self-guided option, you even get a free bottle of wine for your effort. If you’re not keen on drink, or you’re travelling with children, you might instead want to pop along to the nearby Angelina Café for a divine cup of hot chocolate. Or if you’re into tea, check out Jess’s guide to the best afternoon tea locations in Paris. There are a number of places in Paris that I think offer fantastic views of the city, and the Arc de Triomphe is one of my favourites. Found at the western end of the Champs Elysees, this fifty metre high monument to those who died for France in both the French Revolution and the Napoleonic Wars is a must-see when visiting Paris. You can of course admire the arch from below, and be amazed at the efforts of the traffic to get around this monumental roundabout. But to be honest, for the best experience, you need to climb the steps to the top (or take the lift) and enjoy the magnificent views of the city. Note – to cross to the Arch, take the pedestrian underpass. Don’t try and cross the traffic roundabout! 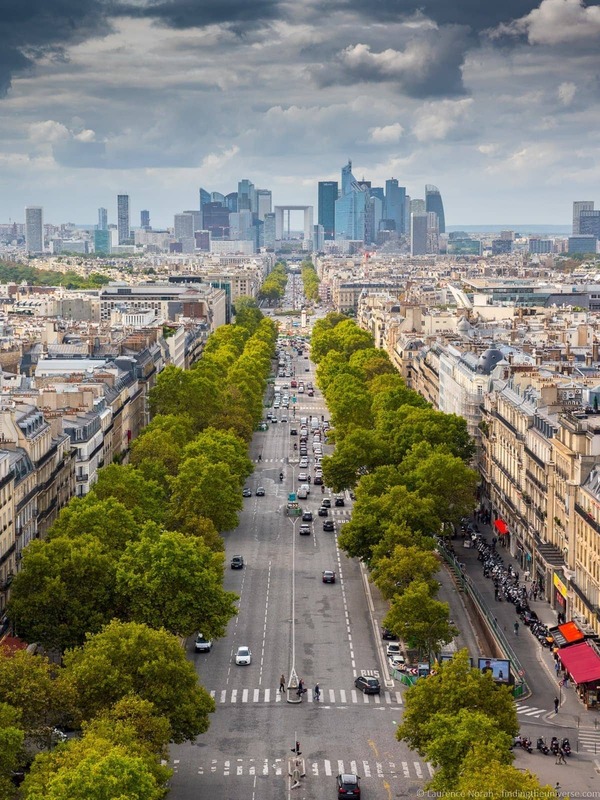 From the top of the Arc de Triomphe you get wonderful views of the Parisian skyline, including the Eiffel Tower, and the business district La Défense. I’d also add, if you take the stairs on your way out, there’s a nice photo opportunity as you look down the stair well from the top of the stairs spiralling down. If you’re interested in more good photo opportunity ideas in Paris, check out my guide to the best photography locations in Paris. Climbing the Arc de Triomphe costs €12. It’s included with the Paris Pass and the Paris Museum Pass, which both also offer fast-track entry. We’re near the end of your first day in Paris and this entry is an absolute must when in Paris – the Eiffel Tower. You will have already seen this magnificent construction looming over the skyline as you wandered around Paris, but I promise you, nothing really compares to standing underneath her and looking up. You can experience the Eiffel Tower in a number of ways. Good views can be had from the Trocadero, on the opposite bank of the Seine. You can also get a lovely view of the Eiffel Tower at sunset from the Champ de Mars – the landscaped gardens that run to the southeast of the tower. This is a popular spot for the sunset in Paris, and many people bring a picnic to sit outside and enjoy the view in the warmer months, often with a glass of wine in hand. If you want to climb the tower, we very much recommend that you book your tickets in advance. This will save you from queuing in the often very long lines at the ticket offices. Tickets can be purchased directly from the official website, which usually has the best prices. In 2018 the Paris Explorer Pass was launched, which includes the Eiffel Tower. This can be a cost effective way for sight-seeing as well – see our guide to saving money in Paris further on in the post for more information. We would say that climbing the Eiffel Tower is definitely something to experience, something everyone should do at least once. There are also restaurants in the tower, which would make for a romantic spot for your evening meal. If you do choose to do this, we’d definitely recommend researching which restaurant you want to visit (prices vary), and booking in advance so as not to be disappointed. 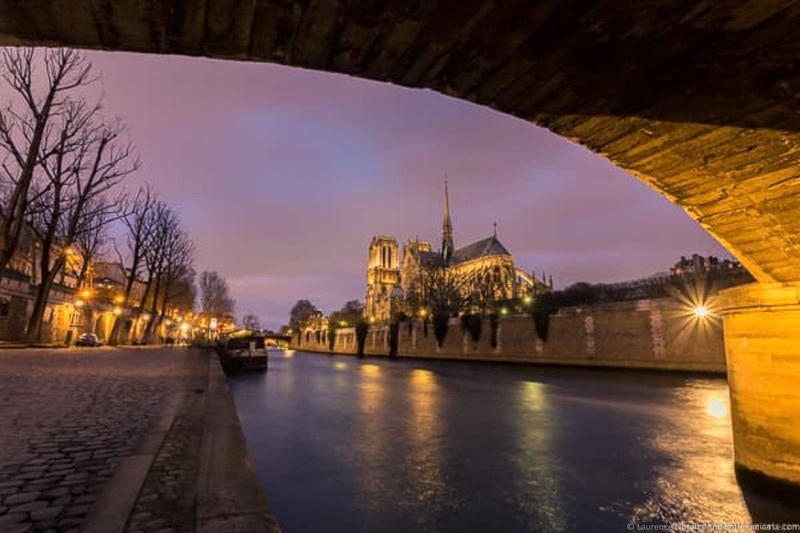 Alternatively, you can do an evening river cruise on the Seine with a meal! See our complete guide to visiting the Eiffel tower for more tips, and to help you plan your visit. One thing many people look forward to when visiting Paris is taking a Seine River Cruise. These let you see a good many Parisian sights from a unique perspective, often whilst listening to a commentary. Most tours last around an hour, and are a nice way to see a lot without too much effort. Just sit back, relax, and let the views roll on by. Jess has written a detailed post to choosing a Seine River Cruise to help you decide between the various operators. There are a lot of options, and even though the view and route will largely be the same, various factors like commentary and boat size should be considered. Some also offer a meal, although if you go down this route, you might have to adjust this itinerary to suit. 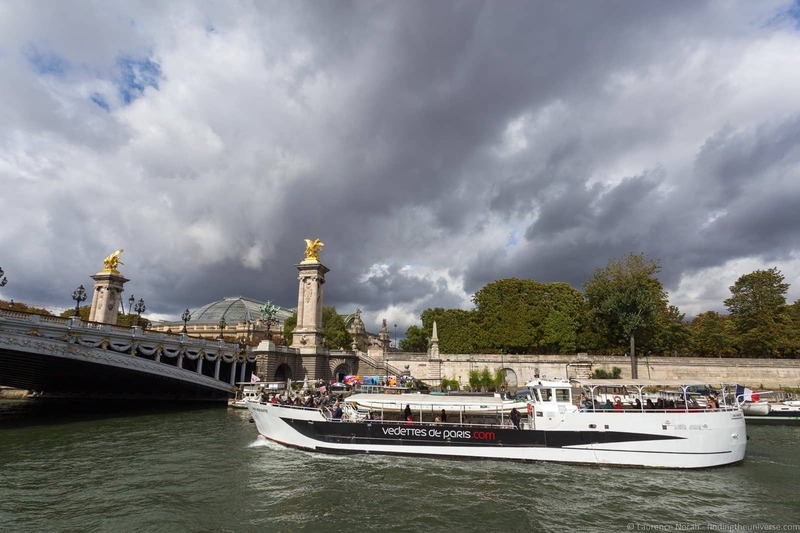 One tip – if you buy the Paris Pass, a Seine River Cruise with Bateaux Parisiens is included. This is a good option, and one we took advantage of on a recent trip to Paris. Your second day in Paris has you starting at the Sacre Coeur in Montmartre. 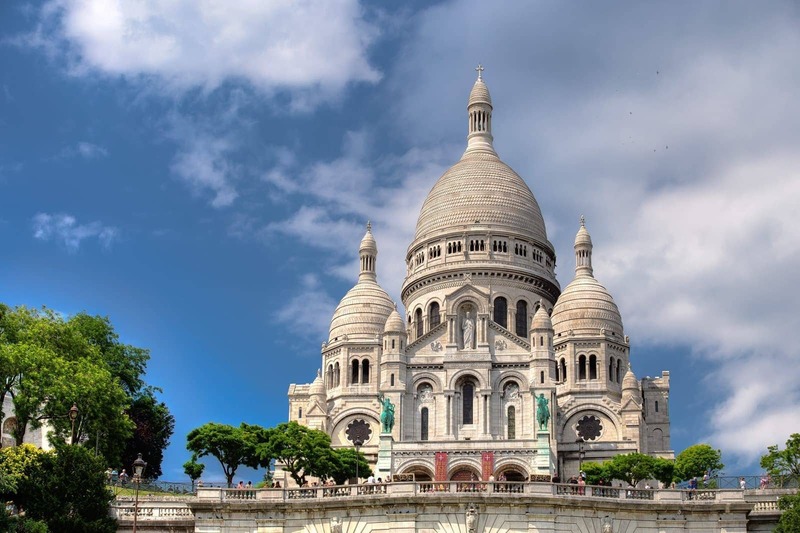 This beautiful basilica is found at the summit of Montmartre hill, the highest summit in the city. As you would imagine therefore, there are excellent views on offer from up here. The Basilica is relatively new, with construction being completed in 1914. Its white domes are instantly recognisable, and you can climb to the top for a fantastic view of the city. Entry to the Sacre Coeur itself is free, although there is a fee for accessing the towers. Montmartre itself is an area which has long been popular with artists, and many famous artists of the Belle Époque era had their studios in this area. Today, you can get your portrait, caricature or silhouette painted at the famous Place du Tertre, a short walk from the Basilica. Note that the steps of the basilica are particularly popular with “bracelet makers”, folks who will try to encourage you to accept a free bracelet from them. Except once they’ve starting tying your wrist with the free bracelet, they’ll expect some money in return. For tips on avoiding this and other common Paris scams, check out our guide to avoiding scams in Paris. Whilst you are up in the Montmartre area, we suggest you might want to take in the Dalí Museum – Espace Dalí. For fans of the artist, who was a part of the Surrealism group that was headquartered in Montmartre in Paris, this museum is a joy. This isn’t an essential visit though, so if you would prefer to just get on with your day, this one can easily be skipped. With over three hundred original artworks on display, this is the only permanent museum in Paris dedicated to the artist. 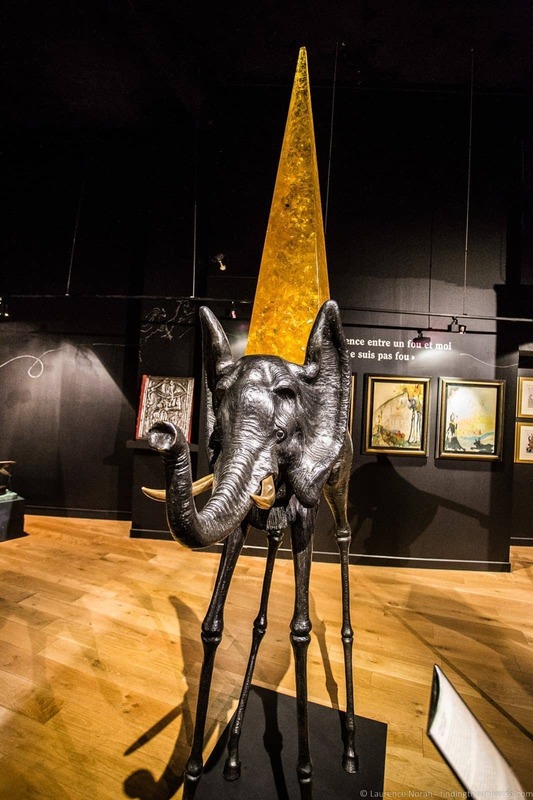 There are sculptures, drawings, watercolours and more on display, and the attached gallery even has some of his artwork for sale. Entry is €11.50, free for holders of the Paris Pass. From the Dali Museum it’s around a half hour stroll, or half an hour by public transport, to the next stop on our two day Paris itinerary – the Opera Palais Garnier. We’re not actually going to the Opera though, although that is of course an option for an evening activity. Instead, we suggest that you take a tour of this spectacular building, which served as the inspiration for the play “Phantom of the Opera”. The tour will give you full access to many parts of this gorgeous building, including the 2,000 seat theatre, the gorgeous grand staircase, the incredible seven tonne chandelier, and the balcony. The tour lasts for approximately ninety minutes, and is offered in English – check times on the official website here so as to be sure you don’t miss it. 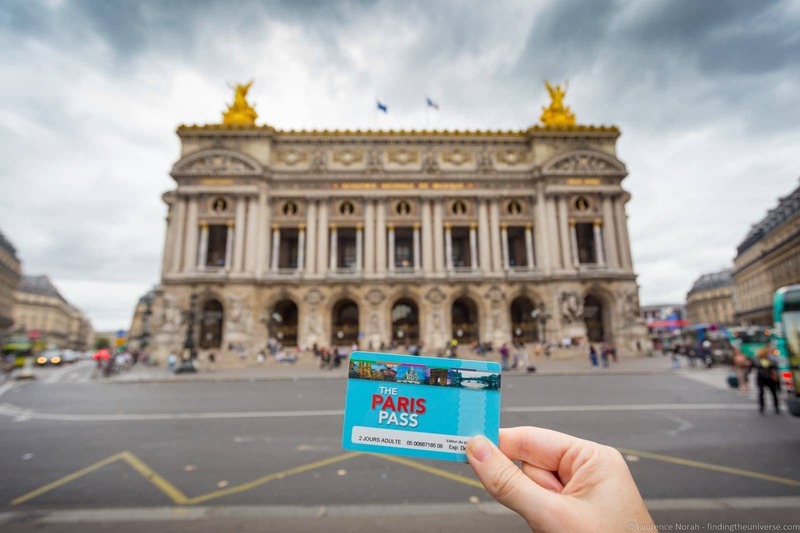 Tours of the Opera Garnier are currently €15.50 per person, and are free for holders of the Paris Pass. 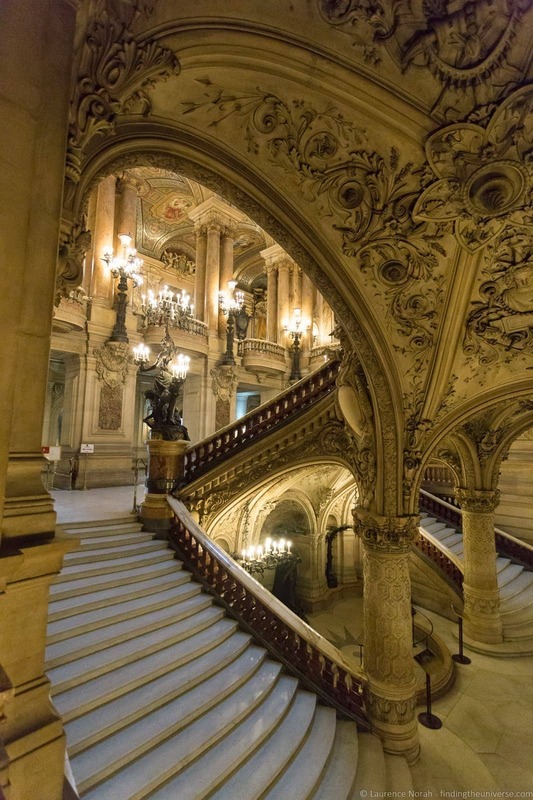 If you are interested in attending a performance at the Opera Garnier, read Jess’s detailed post to booking tickets for the Paris Opera here. From the Opera Garnier we’re going to head to another of Paris’s famous museums – the Musee d’Orsay. Found in a former train station on the south bank of the River Seine, this spectacular building picks up where the Louvre finishes off, with a focus on artworks dating from 1848. We think that the building itself make this museum worth the visit alone. What was formerly the main platform area is now a huge exhibition space which looks stunning, and the beautiful station clocks are seriously photogenic. Of course, the museum has no shortage of art either, with works from Monet, Van Gogh, Cezanne and Renoir all on display, to name but a few. Entry to the Musee d’Orsay is currently €12. Free entry with skip the line privileges is provided to Paris Pass and Paris Museum Pass holders. Paris is a romantic city, and we think that one of the most romantic things you can do is take a wander along the “Left Bank”. In case you were wondering where the left bank is, it’s the south side of the river Seine. It’s called the Left Bank because it’s the left side of the river as you look downstream. From the Musee d’Orsay, it’s a nice stroll along the left bank, if you head in an easterly direction, with views of the Louvre, the Pont des Arts and ultimately, if you keep going, spectacular views of Notre Dame. The last two entries on our two day itinerary can be switched around, depending on what time of year you visit. 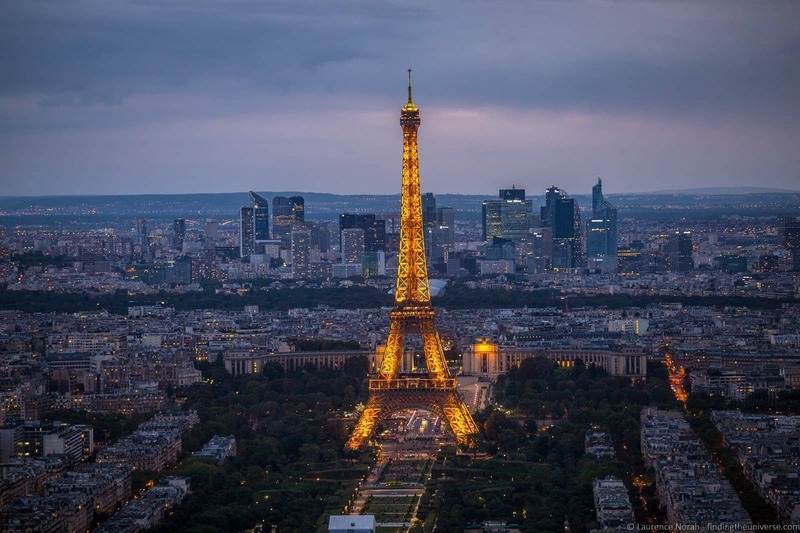 This is because sunset will vary depending on when you visit, and I’d suggest that the Tour Montparnasse is absolutely best experienced at sunset. The Tour Montparnasse is the second tallest skyscraper in Paris, and from its rooftop observation deck you get what we think are the best views of Paris. From here you can see all the way to the Eiffel Tower, Montparnasse and La Defense. At sunset, the view is truly magical, as the sun lights up the sky, and the city lights start to come on. Then – the pièce de résistance – the twinkling lights of the Eiffel Tower herself. Access to the Tour Montparnasse viewing deck is currently €14.50 per person, or free for holders of the Paris Pass. 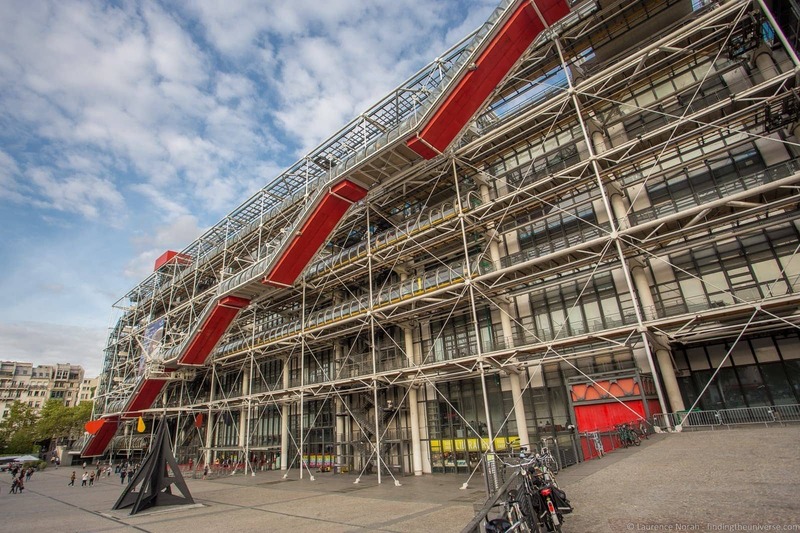 Last on our list of attractions for our two day Paris itinerary is the Centre Pompidou. This is home to a number of things, but we think you’ll be most interested in the Musée National d’Art Moderne – Europe’s largest Museum of Modern Art. This completes the trilogy of art museums in Paris – the Louvre spanning up to 1848, the Musée d’Orsay covers the 19th and early 20th century, with the Centre Pompidou holding the the masters of modern twentieth century art. I’m talking Picasso, Warhol, Kandinsky, and Duchamp. Conveniently, the museum is open until 9pm, which means you’ll be able to visit either before or after your sunset at Tour Montparnasse. Don’t miss the “view of Paris”, a balcony which offers one of the better view of Montmartre in the city. Tickets for the Centre Pompidou museum are currently €14. 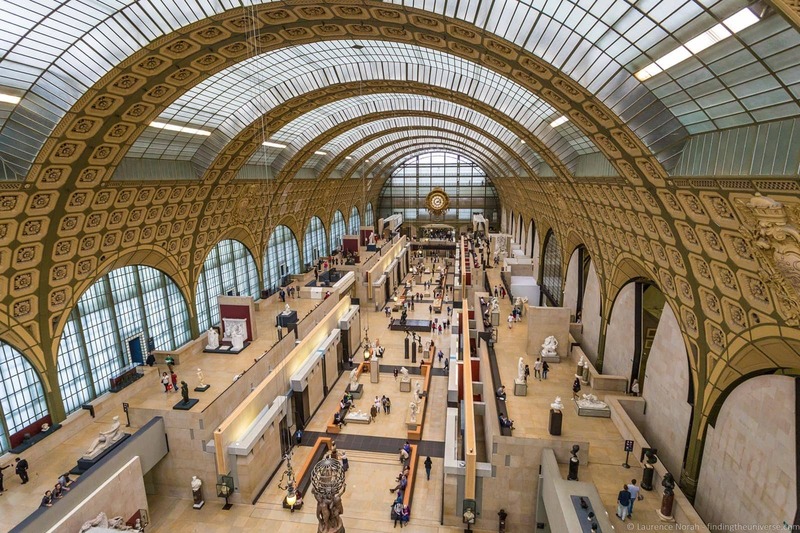 It’s free for holders of the Paris Pass or Paris Museum Pass. Again, this is not a “must-see” in Paris, so feel free to skip this one if you don’t want to feel rushed. To help you visualise all the above, we’ve put the attractions onto a map so you can see where you need to be for each day of your Paris visit. You can see this map here on Google. Paris is a city that is good to visit throughout the year. As with most European cities, it is particularly busy in the summer months, and lines for attractions in July and August can be long. The summer months do however promise the best weather. If you want reasonable weather with less people, then the months of May and September will offer some solace. We also love visiting Paris in both fall and winter, when the leaves on the trees turn golden, and the city lights itself up for Christmas. Basically, we think you’ll have a good time whenever you visit Paris, but just bear in mind that some months are much busier than others. Paris is very easy to get around, with a comprehensive underground (the Metropolitan) as well as buses and local trains. Naturally there are also taxis and private hire cars available. If you avail of the Paris Pass (see below on money saving tips for Paris), this will come with a transport pass that matches the length of the pass, allowing you to travel on any public transport inside zones 1 – 3. These zones cover all the attractions on this itinerary. 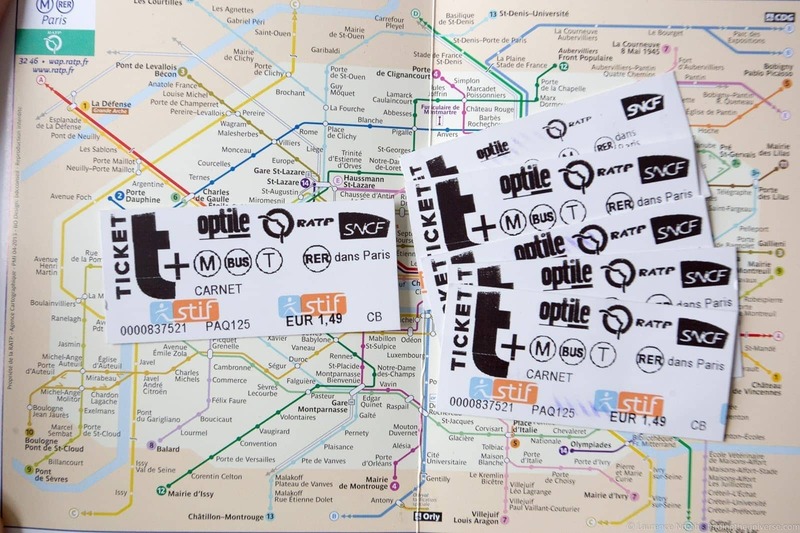 Alternatively, you can buy individual tickets for transport on the metro or bus. The most cost-effective way to do this is to buy tickets in packs of 10, which represents a fairly significant discount on buying them individually. Tickets can be bought at pretty much every metro station from the ticket machines, which accept cash and cards, as well as coming with an English language option. The Paris itinerary above packs a lot into two days, and many of the sights and activities have an associated fee. At time of writing, if you chose to do everything in the above list, you’d be looking at spending just over €200 per person (including a two day metro transport card). The good news is that you can easily save money on your visit to Paris. The answer is to invest in a Paris Pass. This includes access to nearly everything we’ve included in our itinerary (except the Sacre Coeur dome and the Eiffel Tower). It also comes with a travel card valid for the duration of the pass and grants you skip the line privileges at key sights. 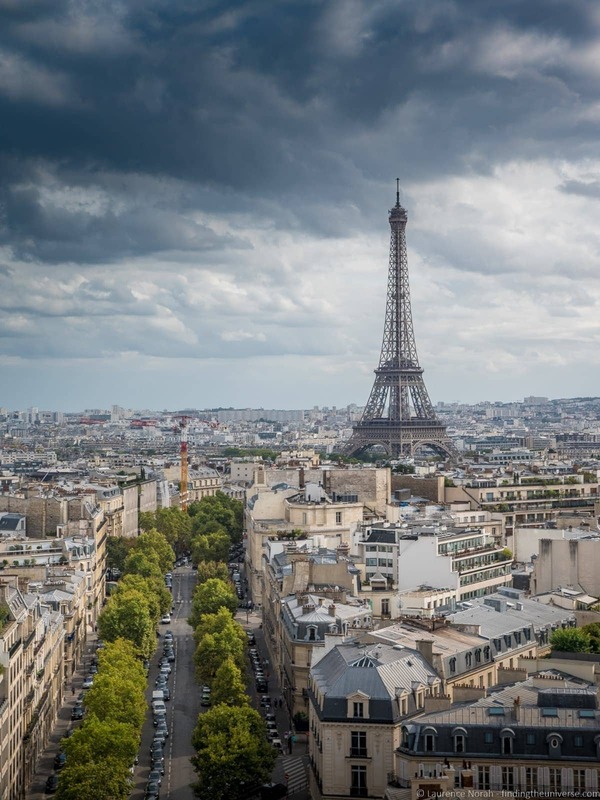 Calculating if a Paris Pass is worth it for you will depend on exactly which attractions you want to visit – to help you out, check out Jess’s comprehensive Paris Pass review post. As a guide though, for the itinerary in this post, total attraction entry and transport would cost you €211.5. At time of writing a two day Paris Pass costs €131. Add in the cost of climbing the Sacre Coeur (€6), and a ticket to the top of the Eiffel Tower (€25), and the total cost with the pass would be €162. This represents a saving per person of €49.50 – enough for a nice dinner somewhere! Click here to buy your Paris Pass in advance. Another option, if you’re not sure how many attractions you want to visit, is the Paris Explorer Pass. 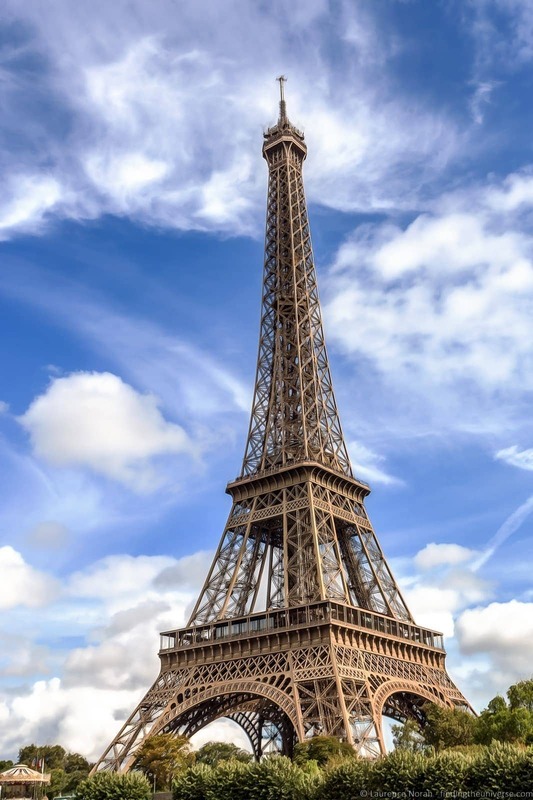 This lets you pick a number of top attractions in Paris (including, notably, the Eiffel Tower), and covers many of the attractions listed in this post. If you aren’t planning on visiting every attraction in this list, then the Paris Explorer Pass might be a better option, as you can pick from 3, 5 or 7 major attractions, and save on visiting those. As well as the above, you should be aware that on the first Sunday of every month, access to most museums in Paris is free – although be aware that popular museums like the Louvre get incredibly busy on these days. In addition, some locations will give you free entry if you are an EU citizen under 26 – you’ll need ID to prove this of course. We’ve stayed at a variety of locations in Paris, from hosted apartments through to hotels and homestays. There’s a massive choice, and prices are generally reasonable considering this is a capital city. We’d advise picking somewhere within easy walking distance of a metro so that you can easily get around all the sights in this itinerary. Our favourite way to find the best deals on accommodation is booking.com. They’re easy to use, usually have the best prices, and have everything from hotels to apartments. If you prefer an apartment, then we recommend AirBnB. We’ve tried all the others, and AirBnB consistently has the most options for locations around the world. See all their listings for Paris here. Plus, if you’ve never used them before, you’ll get up to a $100 discount if you sign up with this link. (Discount varies by currency and if you choose to host at some point). Safety: We’ve not had any problems in Paris, although there are a few scams to be aware of – check our guide to avoiding common Paris scams so you are prepared in advance. Power: Electricity is of the 220v standard, with the 2 pin European style plug. Travellers from countries like the UK and the US will need an adapter like this, and US travellers need to check their equipment supports the 220v standard – it will be written clearly on the power adapter. Currency: Paris is part of the Eurozone, so the currency is the Euro. You can get these from ATM’s, banks and currency exchanges, although credit cards are of course widely accepted. Internet: Internet access is widely available in the form of WiFi all around the city and in hotels and coffee shops, so you shouldn’t have any trouble getting online. You can also pick up local SIM cards if you have an unlocked phone. Travellers from the UK on the Three network will be able to use their Feel At Home data, which is a great deal if you’re a regular traveller from the UK. For more options on getting online when travelling, check out our guide to getting online when travelling to help you figure out the best options. We also have a guide to picking the best travel router, which can help you extend a weak WiFi network and share it across multiple devices. Water: The water in the taps is safe to drink unless otherwise posted. If you don’t like the taste, bottled water is widely available. We usually recommend you travel with a re-usable water bottle like this to save on having to buy water bottles. Eating in Paris: Paris has no shortage of excellent dining options to choose from. Whilst we generally don’t recommend specific restaurants as they can change so quickly, we do have a guide to some of our favourite restaurants in Paris here for inspiration. We suggest that if you do want to eat at one of the more popular restaurants in Paris that you consider booking in advance. We recommend and use La Fourchette, which is the most popular online restaurant booking website in France. It’s easy to use and makes booking a breeze, especially if you don’t speak French. Check it out here to find reviews, sample menus and book a table. A shorter, introduction to Paris walking tour that also includes a river cruise and a game of petanque! 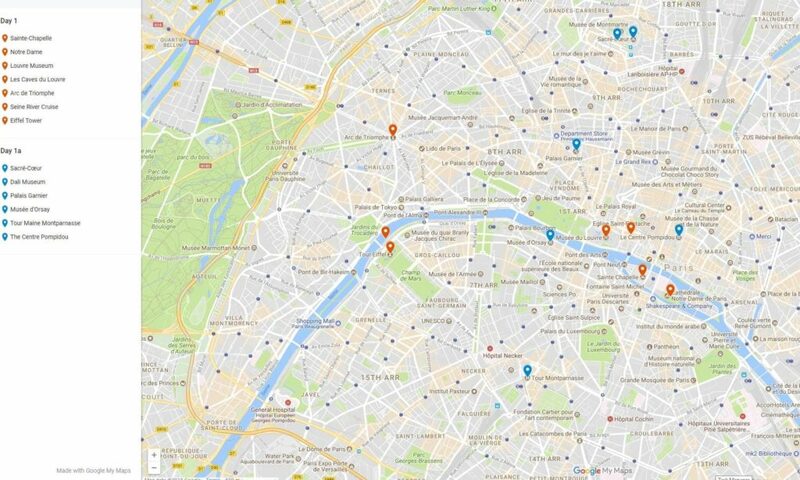 As you can see, there are lots of good options for walking tours in Paris. We’re sure if you want to take a walking tour in Paris, that one of these options will definitely work for you. For walking tours in Paris, we can recommend both Context Tours (link gives 10% off) and Take Walks who both offer tours in Paris. And that’s it! How would you spend two days in Paris? Do you have anything to add to the above, or any questions? Let us know in the comments below! I will be in Paris on 30 – April to 3 – May 2019. Considering it will be my first time in Europe, I was hoping to find a partner we can take this tour with. I don’t know if i can achieve all of these alone as i do not know anywhere. So we don’t have children of our own, so the only experience I can give is that that when I was a teenager my parents took me on an adventure across Europe, and it’s still one of the best trips I remember having. Jess also visited Paris for the first time when she was 16 and had a wonderful time. However, everyone is different, so our experiences aren’t of course guaranteed! That said, Paris is a pretty special place, and I think anyone would love the Eiffel Tower, Notre Dame and so on. I definitely can’t speak to Disneyland as I’ve never been, but I have heard good things. I’m not sure this has helped too much, but hopefully it has been of some use! Have a wonderful trip, whatever you decide to do! Great itinerary unfortunately I see no way to do this in two days. We attempted this itinerary in early January when there should have been smaller crowds and had no luck given the lines to get into the various venues. We even had the Paris pass that supposedly got us into venues fast, with no luck. I would say that you could potentially do all this in three days. By the way, those venues we did get into including LaSalle cathedral were amazing. Thanks for the feedback, that is much appreciated. It is certainly a busy day, but the first day in particular is perhaps a bit optimistic. As such, I’ve updated the text to make it clearer which I’d suggest skipping if you don’t want to feel too rushed. I’m pleased you had a good time though and were able to see everything you wanted! I stumbled across this while looking for the major things to do during a short stay in Paris. We are doing England and Ireland for my 40th birthday in June and doing a quick side trip to París from London. This is exactly the type of guidance I was hoping to find and thank you so much for being so detailed ans helpful. We have a 1 week, 10 day and 2 week UK itinerary. I stumbled across your blog today, looking for a pretty good Paris itinerary and I have to say that I am so impressed. This was so well written and gave so much great information. I was so unsure about purchasing the Paris Pass, but after reading your post, I might end up buying it! Thanks so much. – From a new reader! 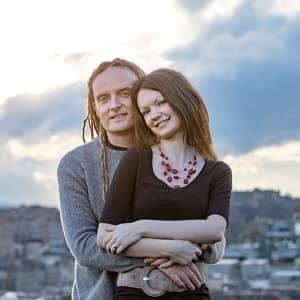 Hi Laurence and Jess, I am taking my husband on a surprise weekend trip to Paris next month and am so glad to come across your blog. I have never seen a travel blog so extensive, thorough, flexible and enjoyable!! You guys are super talented. Thank you so much! Gosh Elly, that is so kind of you. Also, you have a very lucky husband obviously – to be surprising him with such a lovely trip 😀 Thanks so much for stopping by and sharing your thoughts, it means a great deal! Have a fabulous time! thank you so much for this post!! we just got back from our 2 day vacation in Paris and had such an amazing time because of all of your advice!! Me and my colleague will be coming to Paris from Brussels on Thursday lunch time and will be leaving on Saturday morning (around eleven). Will come by train and will fly out. What can be the area for stay in Paris? We are okay with some b&b options. Also one of us have flight at Saturday night. So after checkout in the morning can he dump the luggage somewhere (some cloak room facility) and roam around for the day? We would advise staying in central Paris if you can. You could try this hotel, it is well rated and fairly central. Otherwise you might want to try AirBnB to see what you can find. In terms of luggage storage, most hotels will let you leave your luggage. if you choose an AirBnb, then you can take your luggage to the train stations, all of the major train stations have left luggage facilities in Paris, for a fairly reasonable fee. Hi, My husband and I will be in Paris for 2 1/2 days. We will arrive on a Sunday after a 15 hour flight. I’d love to wander some of the flea markets on that day. Any suggestions on a good one? On our two full days we would like to go to Giverny one morning. This will take up 5 hours, arriving back in Paris around 1:15 p.m. We are planning to visit the Eiffel Tower at 9:00 p.m., on one of the days and, of course want to go to the Louvre. So many of the places on your 2 day itinerary sound like must dos, but I’m afraid our visit to Giverny is going to cut in to things. Do you have any suggestions as to what we might cut out and any thoughts on how to maximize our time. It’s kind of a blur to me as to how to organize our time. Any thoughts and suggestions would be greatly appreciated! Hope this helps a bit – happy to provide more direction if I can! I was actually lost …abt how to plan out 2 days in Paris. Generally, I’d suggest cutting the itinerary in half at least to give you lots of time to rest and take breaks and not be too rushed when travelling with younger people, so this might be a good rule of thumb. Then a mix of activities for everyone. I hope this helps a bit! My boyfriend and I are excited to be spending a day and a half in Paris in early October. It is the last leg of a trip to Scotland and Ireland and we arriving early afternoon on a Friday and have all day Saturday in Paris. Your 2-day itinerary was so helpful in deciding what we want to do — just wondering if what we have come up with is doable in a day and a half? Hi there, this is great info. THANK YOU. I will be travelling to Paris in May with my 14 year old daughter. We are both EU citizens. Do I need to purchase a Paris Pass for her? If I purchase one for myself will she be able to go through the Fast track lane with me? Thanks very much 🙂 As your daughter is under 26 and an EU citizen, she won’t need to pay to access the majority of Paris’s attractions – just make sure you bring your passport with you 🙂 In terms of fast track access, I’ve done some research and can’t find a definitive answer, but I think if she is with you then you should be ok to use the fast track lane together. My husband and I are hopping up from San Sebastián next week and will only have 2 days so this itinerary is perfect and full of great advice! Wouldn’t have thought to see Saint Chapelle. Would be curious to know your thoughts on dining? Thanks again for putting together such an informative blog! Hi Melanie! To be honest we usually just google the local restaurants to wherever we are and find options with high recent reviews, or wander around the neighbourhood we’re staying at and check out the menus of the day. We find that restaurants can change in quality so much that recommendations can be a bit hit and miss. I hope you have a wonderful trip! Musee d’Orsay. Can I include Palace of Versailles instead? Is it doable? Thanks very much! For two days, I thought that Versailles would be a challenge (it’s on my three day itinerary: https://www.findingtheuniverse.com/3-day-paris-itinerary/). However if you wanted to opt out of some of the other attractions, you could definitely do Versailles – it’s your trip so it’s important you do what you want 😀 Just be aware it’ll take you around half a day, and you definitely want to get there early – plan to arrive as soon as it opens so you can make the most of your day. Hello! This itinerary is amazing! Thank you so much for all the work that went into it! Our questions is…we are thinking about going in Nov. 2018…to celebrate my 5oth birthday and our 20th anniversary. We would fly on a Friday but not get in until Saturday mid morning. We would leave on a Wed. Monday is Veteran’s Day and although that won’t be a factor in Paris, we read that many things are closed on Mondays anyway. Our question is…is there a way to split up the 2 day Paris Pass and use it on non-consecutive days? That way we could relax on Saturday, tour on Sunday, relax on Monday and use the pass again on Tuesday? Great question! So, the “easy” answer is that no, you can’t split up the pass as it is for consecutive days, and once activated can’t be paused. So you have a couple of options. The easiest of course would be to buy a longer pass, which comes with longer travel cards and would be easier to manage. The other options is to get a bit creative. The Paris Pass actually comes as two different passes, which can in fact be activated separately. These are the Paris Museum Pass, and the Paris Attractions Pass. These cover different attractions, and you could activate these separately from each. Of course, the travel pass will only last for two days from activation date, so plan your timing on that based on your transport needs. It also includes the hop on hop off bus, which you could do on one of your days. The Eiffel Tower isn’t on any pass, neither is the Sacre Couer tower. Staying in and area called Boulouge. How do you recommend we do this ? If you could be more specific about what help you need I will try to help out! Gosh…. the city of Love ? I am going next month and your pictures are making me excited to go there soon! Are all the Museums open on Saturday and Sunday as well ? Me and my girlfriend will be traveling in Paris around 1st week of May. Just a question the Paris pass (2 day) will give you unlimited access to transportation as well? I was just in Paris in December and had only 24 hours! Luckily, it was my third visit so I didn’t feel like I had to squeeze everything in. (I wrote about what I did here: mywanderlustblog.me) I am making note from your post to see Saint Chapelle on my next visit. Wow, looks amazing! Thanks for sharing! 24 hours is a short time but I’m pleased you saw a lot still. 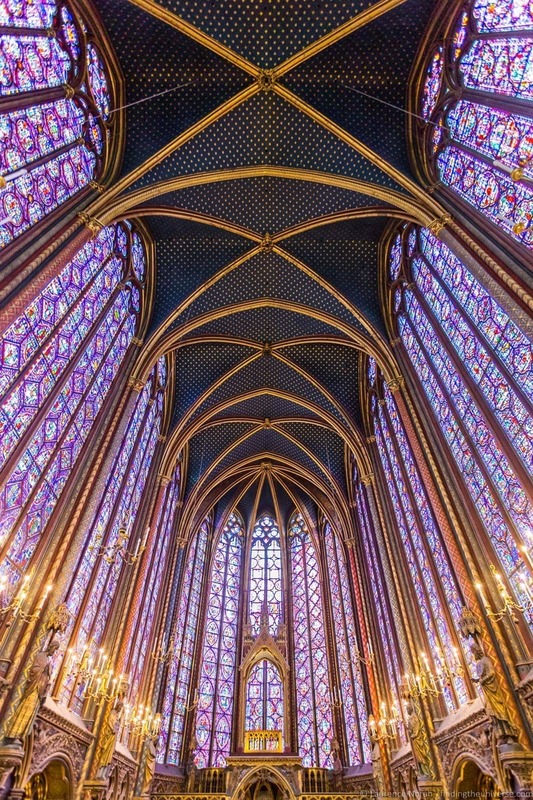 And yes, definitely make time for Saint Chapelle next time! Thanks for all the tips! I’ll be visiting Paris for the first time in March! I’ll be sure to read the other posts mentioned. My pleasure! Paris is one of our favourite cities – have a wonderful time!